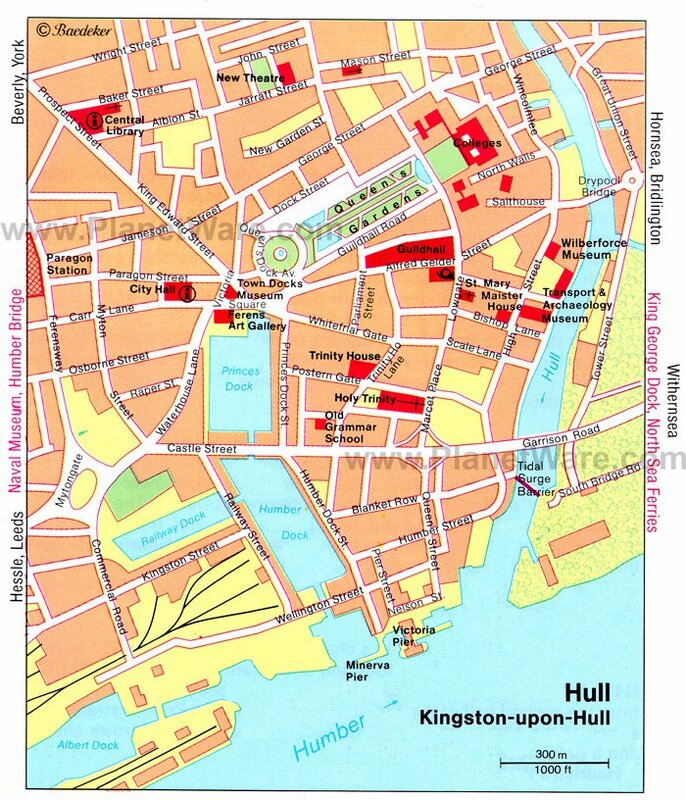 The maritime city of Kingston-Upon-Hull, usually known simply as Hull, lies on the north bank of the Humber, a tidal estuary that cuts through East Yorkshire from the North Sea. The town was founded in 1292 by Edward I as "Wyke-upon-Hull" and in fact straddles both banks of the little River Hull, which flows into the Humber here. Fortified after receiving its royal charter in 1299, Hull remains an important port and busy commercial center for the region. While the city doesn't have a cathedral, the Holy Trinity Church is a noted site dating back to the 14th century. Hull is home to the Museum Quarter and offers many world-class tourist attractions, including Wilberforce House, the Hull and East Riding Museum, and the Maritime Museum. A bustling university town and a popular cultural destination, Hull was selected as the UK City of Culture for 2017. In the former Dock Offices and an integral part of the city's Museum Quarter, the Hull Maritime Museum explores the city's seafaring heritage through models, paintings, and fishing equipment. Its exhibits extend from the Bronze Age to the present day and include the city's Arctic whaling heritage, the North Sea fishing industry, and maritime trade. Other marine heritage sites to visit in the Museum Quarter include Hull's last sidewinder trawler, the Arctic Corsair, as well as the Spurn Lightship. Be sure to spend time exploring the city's historic harbor area, too, which in the Middle Ages stretched between the Drypool Bridge and the Humber. Today, elegant yachts dock in the marina in the former Humber and Railway Dock and at Princes Quay. No. 25 High Street, the birthplace of William Wilberforce, is now a museum with interesting exhibits from the 18th and 19th centuries. Wilberforce was famous in his opposition to slavery, and the museum tells the story of the trans-Atlantic slave trade through to its abolition. While sightseeing in the area, be sure to also visit Nos. 23 and 24, two Georgian houses with fine examples of period furniture. Another wonderful old home is Maister House, a former merchant's home built in 1744 in late-Renaissance style with a Palladian style façade and beautiful wrought-iron banister. Also on the High Street is Blaydes House (No. 6), another restored merchant property from the same period. The Hull and East Riding Museum tells the story of the region from its geological origins in the Cretaceous period to its settlement some 10,000 years ago. Located in the city's Museum Quarter, this popular attraction is home to the famous Hasholme Logboat, a late Iron Age vessel dating from 400 BC, as well as Celtic displays, the excellent Mortimer Collection of Prehistoric Antiquities, Roman mosaics, and Anglo-Saxon artifacts. Also worth a visit, the Streetlife Museum of Transport houses a number of interesting exhibits and collections showcasing some 200 years of Hull's transportation history. Fun things to do here include riding vintage trams, visiting 1940s homes and shops, and horse-drawn carriage rides. The Humber Bridge opened in 1981 and has gained acclaim for its harmonious blend of technology and aesthetics. At 4,954 feet end to end, it's the second longest suspension bridge in the world without supporting columns and offers superb views across the Humber from its pedestrian walkway. While there, explore the Viking Way, a 140-mile-long walking trail that begins at the bridge and heads off into the Lincolnshire Woods, ending in Oakham (there's also a 17-mile extension near Woolsthorpe, leading to Melton Mowbray). Also worth checking out is the Tidal Surge Barrier, built to protect the old city from high waters, and the monthly Sunday farmers market held at its viewing area in Hessle. The Deep is a boldly designed "submarium," with a main tank that's buried 33 feet underground, making it the deepest such aquarium in Europe. Equally unique are the superb viewing opportunities available from its spectacular glass elevator and walking tunnel, with views to the aquarium's 6,500 fish, including sharks and rays. With a focus on conservation, the Deep offers a unique blend of marine life, interactive displays, and audio-visual presentations telling the compelling story of the world's oceans. (Hot Tip: For an added thrill, time your visit to coincide with the always-exciting fish feeding frenzies). Newly renovated and reopened in 2017, the Ferens Art Gallery includes important works by Frans Hals, Canaletto, and John Constable, together with William Hogarth and Henry Moore. Also on display are permanent collections of marine paintings, as well as modern art. If traveling with kids, be sure to spend time in the Children's Gallery, where younger visitors can create their own masterpiece. In historic Hull Market Place, Holy Trinity Church is, according to Guinness World Records, the largest parish church in the country and can accommodate a congregation of more than 2,200. Noted for its Decorated and Perpendicular styles, its fine tower, and richly decorated Gothic-style windows, Holy Trinity was granted Minster status by the Archbishop of York in 2017. In the Elizabethan Old Grammar School (1583) southwest of Holy Trinity Church, this fun interactive museum houses the fascinating history of Hull and its people. Exhibits include a glimpse into Victorian times; the Story of Hull; and the Egyptian Gallery, home to a 2,600-year-old mummy and unique replicas of King Tutankhamun's treasures. Among the school's famous pupils were William Wilberforce (1759-1833), one of the most vigorous opponents of the slave trade and MP for Hull and Yorkshire for many years. Hull's largest open space, East Park features an animal compound with deer, wallabies, rheas, and peacocks, as well as a variety of native Australian birds. Opened in 1887 to celebrate Queen Victoria's Golden Jubilee, this Grade-II-listed park is a vibrant green space encompassing some 130 acres of parkland. Also well worth a visit is nearby Queens Gardens, with its lovely floral displays, fountains, and ponds. Located in the university's Brynmor Jones Library, the University of Hull Art Collection has many outstanding paintings, sculptures and drawings produced in Britain between 1890 and 1940. Featured artists include Walter Sickert, Samuel Peploe, Lucien Pissarro, Stanley Spencer, Jacob Epstein and Henry Moore. The university is also the home of the Hull City Archives, Hull Local Studies Library and Hull University Archives. The town of Barton, just 11 miles from Hull on the south side of the Humber (a trip that involves crossing the Humber Bridge), is home to the 1,000-year-old St. Peter's Church, notable for its more than 2,800 burials from Anglo-Saxon to Victorian times. Now under the auspices of English Heritage (with limited opening hours), its Anglo-Saxon tower and baptistery have helped make it one of the most studied churches in England. Other attractions in historic Barton include Baysgarth House Museum, the Wilderspin National School, and 51 Fleetgate, believed to be the oldest residential house in North Lincolnshire. Also worth visiting is the Waterside area stretching along the Humber Bank, home to The Ropewalk arts center, Waters' Edge Country Park, and Far Ings National Nature Reserve. Holiday Inn Hull Marina: mid-range hotel, harbor views, modern decor, friendly staff. Kingston Theatre Hotel: 3-star hotel, family run, Victorian building, quiet location, complimentary English breakfast. Premier Inn Hull City Centre Hotel: affordable rates, great location, modern decor, free parking. Travelodge Hull Central: budget hotel, bright rooms, tea and coffeemakers, family rooms.